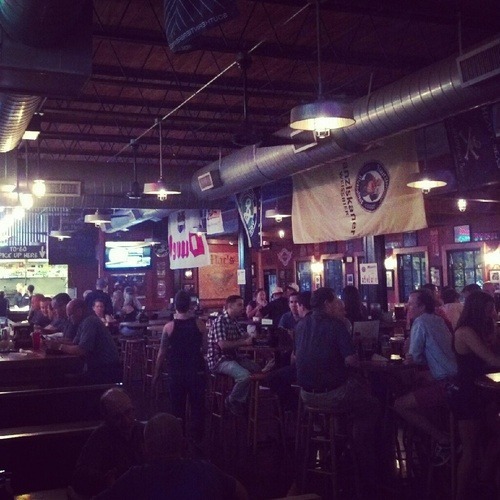 Monk: Mac’s is a “biker bar” and while it does attract a biker crowd, there’s nothing there that would make your average yuppie squirm or feel uncomfortable. 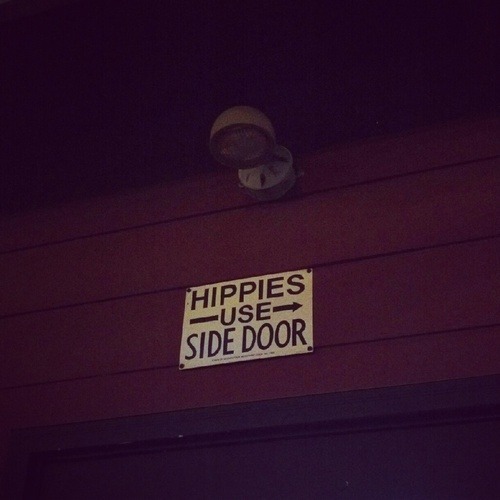 In fact, I’d argue that yuppies are really the true target demographic for Mac’s. Since we’ve started coming here, it has expanded its patio seating to one of the better patios in town and thankfully we were able to sit outside on a Friday night with no wait. 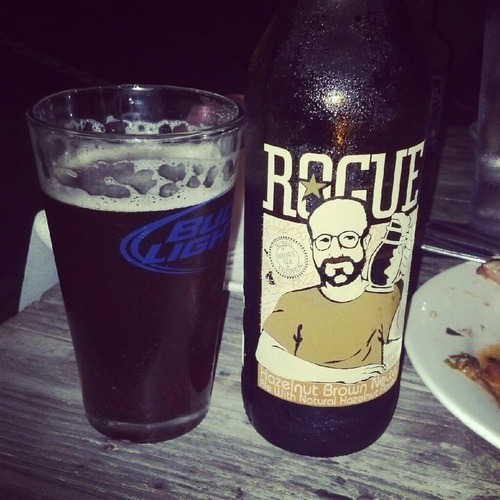 One of the things I’ve always dug about the place is the great beer selection – this is the only bar or restaurant in Charlotte that I am aware of where I can get my longtime favorite beer, Rogue Hazelnut Brown (in a 20 oz. bomber, nonetheless). They have a wide variety of beers on draft and bottle, and were even doing the canned craft beer thing before it was fashionable to do so, so credit to them for that. Speedy: Our order here was actually a pretty difficult choice. We obviously were going with a combo platter, but wanted even more variety beyond that. For some reason, Monk took a shine to the Kansas City beef rib on the menu, so that was ordered as well, along with an appetizer of smoked wings. Rudy: I can’t decide if I feel jealous of the fact that you guys are always getting wings at your barbecue places. While I love wings and I love barbecue, I have never been to a barbecue place that offers wings. I think I am going to have to find some and try them at some point. Monk: I guess that’s a good thing about going to these “barbecue fusion” places – you get things like wings on the menu. I hadn’t had a beef rib in I don’t know how long (I missed out on them at Buz and Ned’s) and we don’t really see them on most menus, so I thought it might be something worth checking out. This was our buddy Sus’s first time taking in a barbecue spot with us since the blog started, and he couldn’t have been more lost. Between me stepping away to take photos and us wanting to sample just about everything, he eventually decided to focus on his beer and let the pros handle things. Speedy: The wings came out pretty quickly – and we got 7 even though we only ordered a half dozen…suckers. They were quite good – properly smoked and the sauce had a decent but not overwhelming kick. Definitely one of the best parts of the meal. Monk: The entrees didn’t take long before they were brought out and HOLY HELL IS THAT A BRONTOSAURUS RIB?!?! The beef rib was by far the largest one I’ve ever seen. I mean, it was comically large – as in straight out of the Flintstones or something. Rudy: That was one of the things I had to get used to in Texas coming from North Carolina. I thought you ordered a rack of ribs, but they were selling them by the pound… and a single rib was a whole pound! I think they are very good, but I also feel strange when I order them because I think they look comical. Speedy: As for the meat, I think we both agree that the brisket was just bad. It was tough, overdone, and lacked flavor. I couldn’t have been more disappointed. I know brisket is tough to cook, but it amazes me how bad some of these NC places are at it. Mac’s was probably the worst. I’ve had the brisket there before and don’t remember it being that bad, so it could’ve been an off-night, but I think it’s best to just steer clear. Monk: While the pulled pork had decent bark (at least what I pulled onto my plate did; Speedy had some complaints), the meat was dry and begged for one of the three sauces on the table – Carolina BBQ, Red BBQ, and SC Mustard. Ok, well not really the SC Mustard – I mean, who would add that to pulled pork? Speedy: I have no idea why these places insist on serving it. I definitely have opened up to different barbecue style over the last several years – mainly due to being able to travel to Memphis, St. Louis, and Texas and sample all that’s there. However, I’ve also spent lots of time in South Carolina (and had some great barbecue there), but I’ve yet to budge on my opinion that mustard just does not belong on barbecue. But anyway, off my soap box and back to the food. 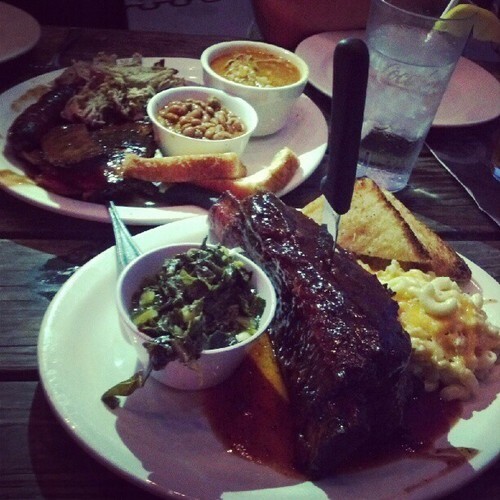 Monk: As for the beef rib, well…I liked it a bit more than Speedy did but it was quite fatty. We were expecting a platter of beef spare ribs, not a huge slab of meat connected to a single bone. Looking on the menu online now, I do see that it does say “rib” singular. Other than the hilarity of how big it was, in hindsight it wasn’t the best decision to order. Speedy: I thought the St. Louis style ribs were pretty good. They probably could have been a little more tender, but I did like the sauce quite a bit. If I went back, this is probably what I’d order. Monk: I would agree. As has been documented here, I’m becoming more and more a fan of Texas sausage. So much so, in fact, that it’s now pretty much an automatic order if I see it on the menu. The sausage here was a bit dry and required the mustard sauce that it came with, but it still had good flavor and was one of the better parts of the meal. Speedy: I was disappointed that the combo platter only came with one sausage link (to be fair, we did order the small platter), and I thought the sausage was pretty good, so I ended up ordering a sausage sampler and some hushpuppies for dessert. Monk: Mac’s serves sides of honey butter along with the hush puppies (of which I am a huge fan) – so big ups on that. Speedy: The sampler came with Texas beef sausage, andouille sausage, and kielbasa. All were good, though I think they were overcooked slightly. The mustard based barbecue sauce worked well with the sausage. I also had a hard time distinguishing between the three types. Initially, I thought ordering this extra plate was a mistake, but when Sus decided to pick up the bill, it suddenly was a great idea again. Rudy: The only thing better than barbecue is FREE barbecue. Speedy: I guess not everyone has a sophisticated enough palette to be a Barbecue Bro, Monk. Monk: True, not everyone can hang. 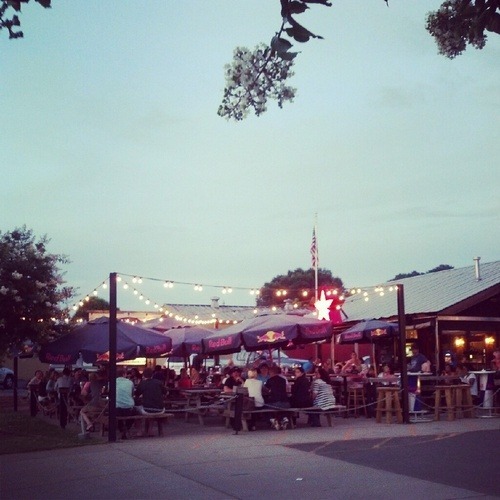 So, Speedy, other than the atmosphere of the outdoor patio is there much of a reason for you to recommend folks come here if they are looking for good barbecue? Speedy: No – not really. 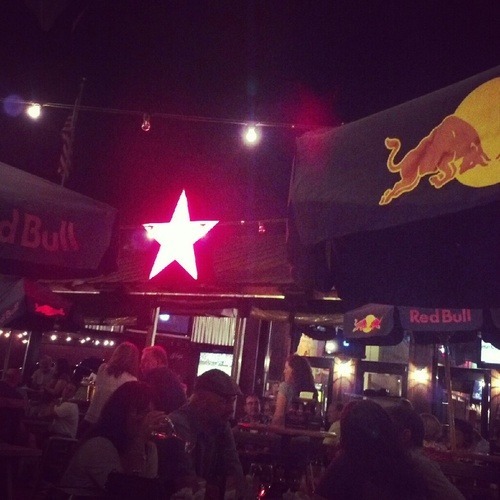 Like you said, the beer selection and atmosphere are really the best things about the restaurant, and while I appreciate that, it’s not what you want from a barbecue joint. So if you’re looking to have a beer or two with friends in a fun spot on Friday night, by all means, go to Mac’s. If you’re looking for good, authentic barbecue, there’s definitely better options. 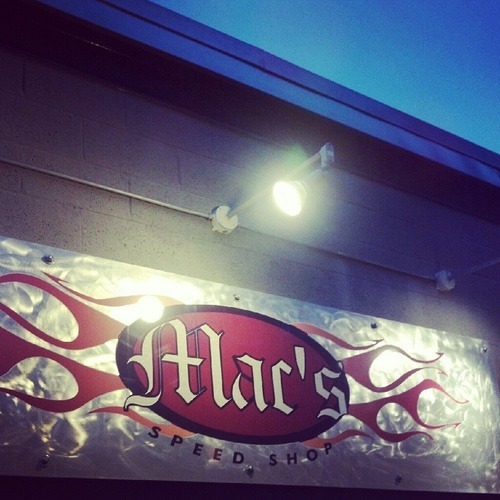 Pingback: Mac’s Speed Shop, Charlotte NC – Marie, Let's Eat!